‘Collaborative learning is when you can achieve something with some help from your group and then work independently with what you’ve learnt’. ‘Collaborative learning is when we have a group who helps each other instead of a teacher’. ‘Collaborative learning allows us to work as a group to greaten our chances of success through the opinions of the ENTIRE groups, as opposed to one person’s view’. A concise definition of collaborative learning has been viewed as the ‘Holy Grail of interactive learning’ (Panitz, 1997). Identifying theory, principles and potential practices of collaboration to model CGL was an extremely problematic undertaking. The application of collaborative learning as an umbrella term for anything that seemed to involve socialised-learning (Smith and MacGregor, 1992) and with definitions often contradictory or unsatisfactory (see for example Roschelle and Teasley, 1995; Burton et al., 1997; Panitz, 1997; Dillenbourg, 1999) a lack of clarity in what separated cooperative and collaborative learning theory, practice and product became evident. To attend to this I sought to isolate CGL from other forms of socialised-learning by identifying key principles for each facet based upon the pertaining theory of learning, group composition, learner relationship and nature of the pedagogic activity. that positive interdependence (Johnson and Johnson, 2008, p.17) in learning is being applied. Applying this paradigm to CGL recognises that learning is an active process requiring deliberate cognitive engagement, a thinking interaction (Brown and Thomson, 2000, p.26); that for this process to occur contexts rich in problem solving and knowledge construction, rather than mere knowledge acquisition and application, need to be experienced (Long, 1990; Cohen, 1994); and that verbal communication is central to the learning process, with dialogue the route to individual or group knowledge construction. These principles aided the construction of practices, comprising Collaborative Problem Solving (CPS), Collaborative Project Work (CPW) and Collaborative Essay Preparation (CPW), designed to facilitate CGL (Fig 1). In order to engineer CGL the group construct also required clarification. An application of the CGL theory and principles to a review of the literature relating to group composition, the optimum group was identified (Fig 2). In particular a heterogeneous group of diverse experience, talent, and ability, is needed to enable zonal overlap (Vygotsky, 1962) enabling a process where every learner is a novice and expert in different contexts and every learner has an opportunity to teach and be taught. Such an interaction was perceived to be central to the optimization of the effects on learning of engaging in CGL. 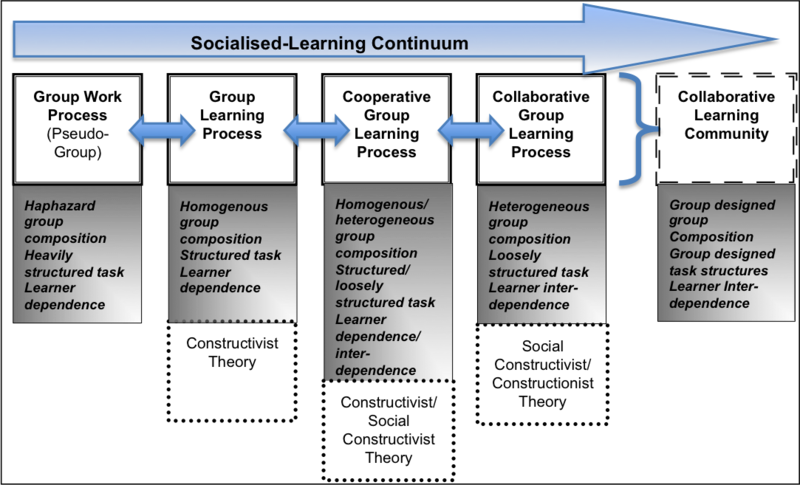 A process of socialised-learning derived from social-constructivist and social-constructionist theoretical approaches to development, learning and group interaction. It is identifiable by three prerequisite facets: a heterogeneous and stable small-group composition; shared non-foundational knowledge construction; and learner interdependence.